As most GIS users will know the Landsat archive of satellite images is available for free download from USGS. This is a valuable resourse of historic and recent course resolution images covering most of the earth. I find the USGS Global Visualization Viewer the best way to sort through and download images. You need to add images to the basket. Often you can download them directly from the basket, but sometimes they need processing time which can take a day or two. Note that images from L7 2003 onwards have lines of no data caused by a faulty sensor. Up until recently L5 was still working producing quality images but is now out of service. Shortly we will have Landsat 8 – it has been launched and more free imagery is not far off! Once the image file is downloaded you will have a compressed .tar.gz file which can extracted using built in Windows functions or 7Zip. Once extracted you have a TIFF (.tif) file for each of the bands of the image. For L7, that is 9 TIFF files about 60mb each except band 8 which is higher resolution band for pan-sharpening usually 200mb+. The next step is to composite these bands to make a coloured image to load into your GIS. If you are a Windows or Mac user I suggest you try out MultiSpec. Download and extract to a folder of you choice. I keep it at C:MultiSpec for simplicity. 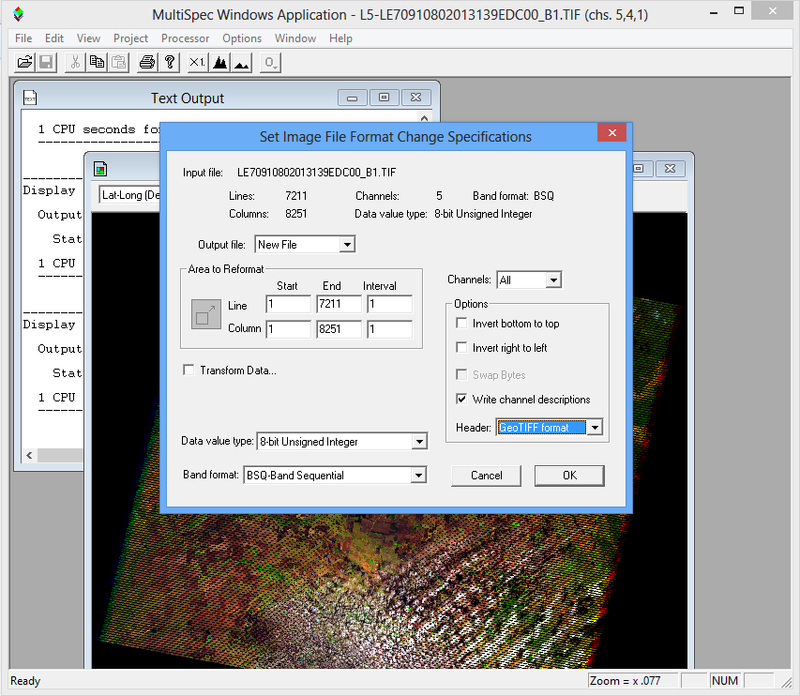 A comprehensive guide on how to composite images has been written up by the creators of MultiSpec and is available here. The process I give below is a simplified explanation based on the MultiSpec tutorial. 2. Go to File > Open and select all bands you want to composite into one image. 3. For the ‘Set Display Specifications’ dialogue press OK (Try setting Bands to Red: 5, Green: 4 and Blue: 1. This is not critical for this exercise but is useful to visually inspect the image inside MultiSpec). 5. You can select Channels and reorder by choosing ‘Subset…’ (I usually include bands 1-5) and also select file format in the ‘Header’ drop box (I always stick with GeoTIFF format). Press OK and choose where you want your composite image to reside and give it a useful name (do not forget to add the .tif extension). 6. Load up your favorite GIS desktop software, QGIS for me, and add your new TIFF file. 7. Edit layer properties and try a few different band combinations and contrast enhancements. For good visibility of vegetation try Red: Band 5, Green: Band 4 and Blue: Band 1. For a more natural look try Red: Band 3, Green: Band 2 and Blue: Band 1. I hope this helps make Landsat imagery more accessible to everyone. Lizmap is Open Source software that has the capacity to display GIS data on the web with minimal effort once it has been configured correctly. 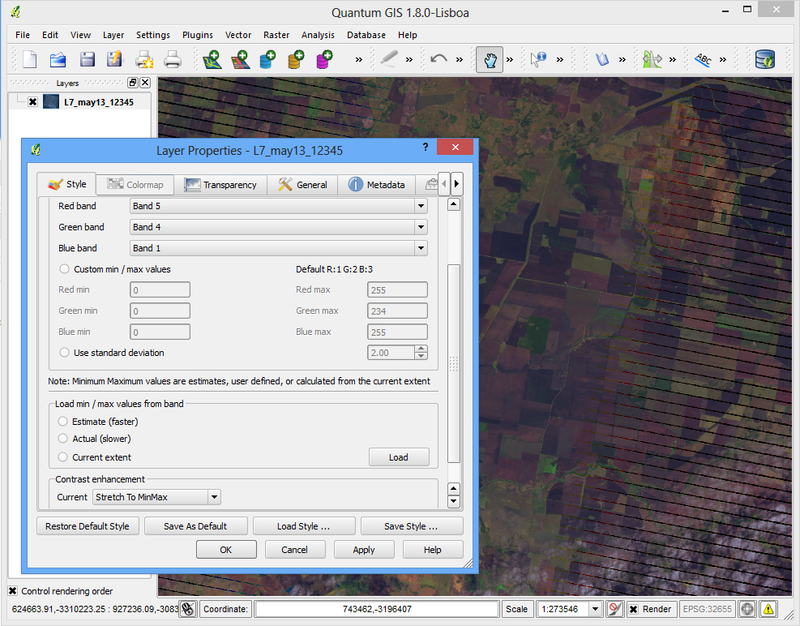 This software sets itself apart by making use of the QGIS Server in a unique and user friendly way. In essence this allows the user to configure a map in QGIS desktop software and simply run a basic plugin to publish their data on the web with a Google Maps satellite or street layer as a base map. I have setup Lizmap software on my server to demo its capabilities. I left the original demo map of transport in Montpellier, France and added my own with data from Lindon – one of our properties. I hope to demo its mobile device capabilities soon. Lizmap Web Client displaying Lindon property map. The process to convert point data to raster (or grid) for can differ dramatically depending on who you ask and the purpose of the conversion. Generally data is processed for two main functions. The first being ‘stacking’ or ‘layering’ to later develop prescription maps or other further processing. The second is improved visual representation of the data. My process aims to satisfy both with minimal processing time. My method does contain some compromises; since I use a coarse resolution it is not as pleasing on the eye as some other methods. In addition, my data smoothing technique is quite broad which means you will loose some detail in the grid. Clean up point data either manually manually or with a filter to remove any obvious errors such as where header turns in paddock. EDIT: I am currently trying Yield Editor for this step. Produce a grid over the top of the point data. Any cells that share a points average the point values. Gaps in the grid are filled in. Gaussian Filter is used to ‘smooth’ the data. Note: You will need to have SEXTANTE and additional toolboxes setup to follow these steps. Instructions are available here. Make sure you do a visual comparison with original point data to ensure the final grid is a good representation of the original data. Visually check to see that processed grid file is a fair representation of the original point data. Note I was lazy in this photo and used un-filtered yield data. To generate useful color maps to represent the grid data try http://colorbrewer2.org/. One day I will explain this process, but it is not too hard to try it yourself. Now when we get clever we can use the SEXTANTE Modeler to automate this process. More on this later! –Edit: Here is the modeler info. I’ve recently started playing around with QGIS plugins on my Windows 8 (and 7) machines. After working through the initial process which I discussed here I had a go at making my own (very) simple plugin. The purpose of the plugin was to allow easy access to zoom and pan functions for a touch screen laptop such as my Panasonic Toughbook. I use the BigButton plugin in conjunction with QGIS Tracker and OpenLayers. 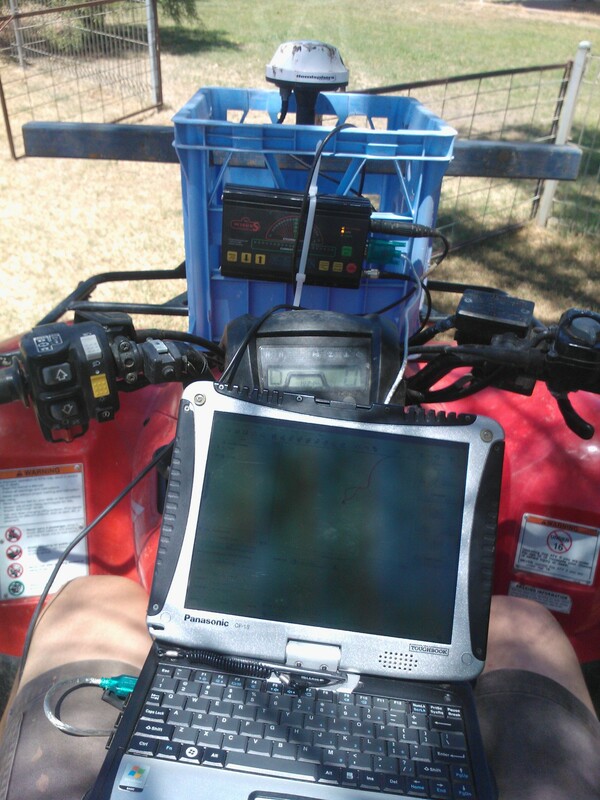 I mounted a GPS on a quad bike with my Toughbook and went out to record a trip with live Google Maps underneath. This worked to a point. BigButtons will not work properly while QGIS Tracker is Tracking GPS Location as it is programmed to keep the marker centered. Once tracking is stopped BigButtons functions as normal. As the marker direction from QGIS Tracker changes in reference to the GPS bearing the Google Satellite from OpenLayers plugin will go white underneath. BigButtons ‘Cycle Layer’ currently only works if you have all layers in a single group – and even then can do some strange things – needs work! After being fresh out of Udacity CS101 – Computer Science course I wanted to put my new Python skills to use. QGIS supports plugins programmed in Python so I thought I would give that a go. What I realised is that there is a missing link between an introduction to programming and how to apply it! 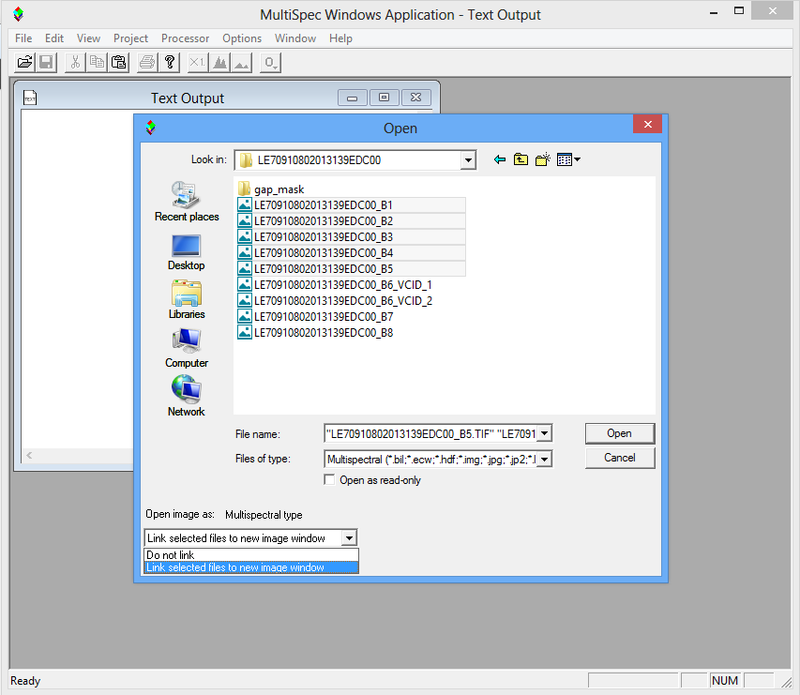 After several hours I was able to complete a simple plugin and get it working, with a GUI – all in Windows 8. 1. 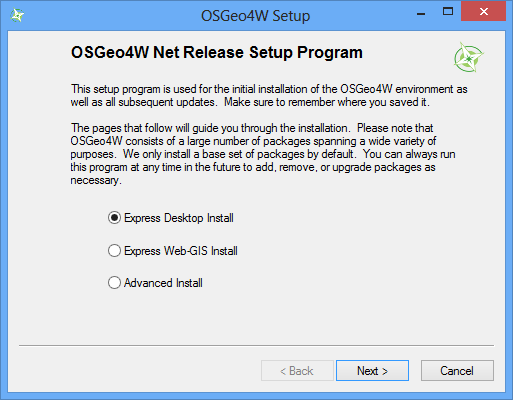 Install QGIS 1.8 using OSGeo4W. Select ‘Express Desktop Install’. I installed all packages even though we won’t be using them all. It is worth having. 2. Download and Install Monkey Studio IDE. Optional: Download QGIS APIs for auto-complete. You can add these to Monkey Studio by going to Edit > Settings. In ‘Source APIs’ select Python as language and add all the .api files. I sources these files here but stored them on my server in case the drop box goes missing. 3. The first Plugin I made was called Zoom to Point. I used instructions from a book excerpt available here. Chapter 15 – GIS Scripting, starting at page 270. QT Designer is built into Monkey Studio. When you need to edit ui_zoomtopoint.ui launch Monkey Studio, then open this file to edit it. Run the command line commands in the OSGeo4W console which should be on your desktop from Step 1. Navigate to your plugin directory e.g. In the file zoomtopoint.py (around line 27) I changed ‘import resources_rc’ to ‘import resources’. Otherwise I get an error in QGIS. Every time you make a change to your plugin you need to restart QGIS. There is a plugin called Plugin Reloader that speeds this up allowing you to reload plugin with restarting QGIS. Be very careful manually copying code. Most of my errors came from incorrectly copying code! I hope that saves some others a few hours starting out. I have just scratched the surface and am looking forward to building some handy QGIS plugins as time allows. For some reason if I create my Class name (ie when creating plugin template in Plugin Builder) in all lower case it does not build properly with pyuic4. If you have this same problem try using CamelCase and see if that makes a difference – it did for me.